Student Ambassador Review: The Seventh Seal. 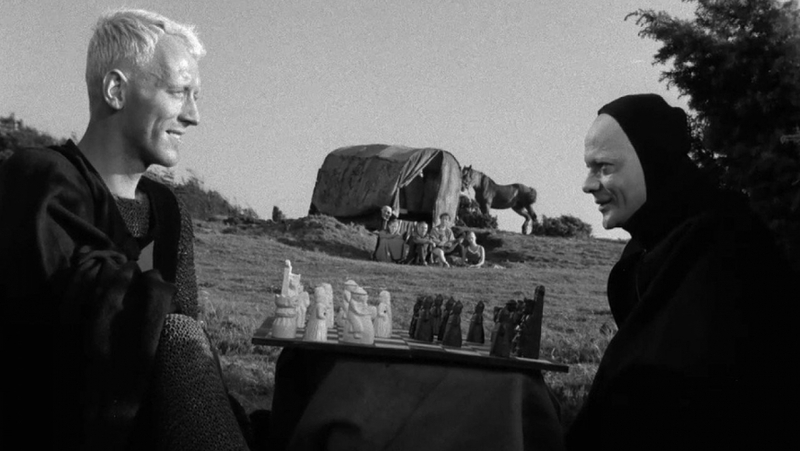 A knight returning from the Crusades (Max von Sydow), encounters Death on a desolate beach, and challenges him to a game of chess, to avoid or at least delay his ineluctable fate. Directed by Ingmar Bergman, this picture is an allegory of man’s search for meaning and answers to existential questions, especially as death shows its face on the horizon. It is exhibited in this account by the use of strong and explicit images, and profound and philosophical spoken words and dialogues. Death is not only the subject matter of the film, it is also physically present all along the story. Whether it be its personification hounding the protagonists, the showing of symbols such as the skull mask, or even the corpses found along the way. These representations are here as a reminder of death’s constant presence and its closeness with the living, in this narrative. Antonius Block, the knight, sets the pace of the reasoning, as the spectator refers to his train of thought so to find his own answers to the character’s questionings, which could very well be, in reality, anyone’s questionings. Watching this film, I realised that fear of death can find its genesis within the fear induced by the uncertainty and emptiness we attach to it. This uncertainty that can paralyse and forbid to take action. Fear, of death or else, can preclude to live life meaningfully, and faced with death, fear becomes ever more gripping with the realisation that the life lived was empty and the actions undertaken within its frame meaningless, but that it now might be too late. However, if emptiness is replaced by knowledge, and death’s existence acknowledged and accepted, then it shall not be feared anymore. Furthermore, this feature scrutinizes the connection between a man’s examination of his life and his religious belief, its causality and intensity, during periods of high uncertainty and fear. Faced with his own mortality, Antonius who didn’t have faith, is now on the verge of surrendering to God, perceiving it as a guarantee, and possible answer to his unanswered questions. The great dilemma of the man who didn’t believe, but now tries to, is that he has to accept the fact that his faith ought to be solely based on faith itself and the strength of his will, without tangible proofs and signs, and this choice, this uncertainty upon which his life might be reliant on, makes him all the more scared and doubtful. Until he decides to accept it. However, the knight was never really able to completely reject the possibility of God’s existence, for it would mean that he is all alone, left on his own, his fate in his own hands, his life, and possibly, his death, being his responsibilities. Was he ever willing to carry this burden? A feeling of plenitude emanates from this picture.